I have not made much progress with my sewing this week! First, a distraction - going through my sewing room, I found a hat for my pal PEC that I had cut out and buried - it was supposed to be for Christmas. SO I proceeded to make it for her. I did get the patterns trimmed and adjusted for the shirt (below) and the dress (red fabric in previous post). So ... if as promised, tomorrow will be a day of ice and snow, I will be staying in to sew! Grant season is open, so my time to do so will be more limited in the future. I have a number of UFO's I have to finish - a round robin quilt, a hand sewn quilt I started in 1999, etc. So this spring should be a busy one for me. After considerable pondering, I've decided to forgo the red knit for now, and make my next project a top. It is still a Khaliah Ali design from Simplicity. I think making the top will give me a better idea of the alterations I will need to make, rather than the knit. I may even make a skirt from a Burda pattern I picked up last week. I love the bell sleeves in this pattern. I am going to go for the surplice top design with bell sleeves, the second design in the second row of the drawings. The fabric I am going to use is from Hancocks, on one of their sales late last year. It is teal with a black imprint that resembles lace. Progress: I have steamed the fabric and dried it, am going to get the pattern pieces picked out and trimmed today. The photos are of a sewing machine matt, with detachable trash holder and magnetic pin cushion that I made for my friend in England, Paula. I sent it for her birthday on Saturday, and for once, it arrived the day before! Last year, I used the same material and same sized squares to make her a sewing machine cover. The cover featured a prominent photo of Paula and I in front of Windsor Castle during my visit in October 2006. It seems like a very long time ago now. I finally finished the pink nightgown this weekend. They are both from the Butterick pattern. I love the flannel - it is snuggly warm and just perfect on these zero degree nights. The pink one, I'm not so certain about - as my husband said, that is shiny. I think that is the understatement. (edited photo 1/30/08). I've always loved the femininity of the Oscar de la Renta designs. But I have absolutely FALLEN IN LOVE with this design for a coatdress. 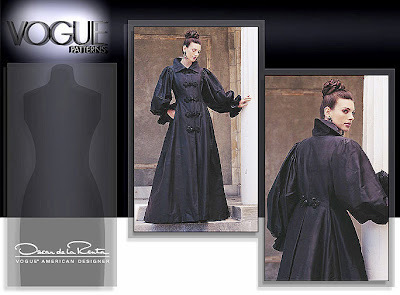 It is shown in the catalog and in the Pattern Gallery of the Dec 07/Jan 08 Sewing Today's Vogue Patterns. Next week Hancocks is having a sale - 75% off Vogue Patterns. I must get this one - even if I never make it. Of course I'd love to make it - it could be so many different things. Light pink taffeta or silk dupioni? Maybe aqua. Now there is a super secret sewing project I've been on, photos of which I shall post after my pal P receives her birthday present. But meanwhile, I've been sewing as I planned - which is an amazing thing in itself! The cat fabric above is flannel. Yesterday I completed (aside from the buttons) a long flannel nightgown from Butterick 4670. It was fine, the instructions were clear, but it took longer than I thought it would. I made some changes - no frills or lace, I put a bias binding on the collar, cuffs and hem. I have almost completed a second nightgown. This is in flannel backed satin. I did not have quite enough, to make what I wanted, and of course when I returned to the store, they did not have the fabric. So I got a plain pink and I am using that for the sleeves. It is close to done, and I hope to finish it tonight. I added a short but full flounce to the bottom of the nightgown and will use the Russian Doll fabric as a binding on the sleeves to tie it together a bit. And finally, I found some "almost sweater knit" on clearance. I just love this fabric for some reason - the varigated reds attracted me. I am not usually a red person, but I seem to be developing a theme, given the bags shown below and this fabric. I am going to use this fabric to make Simplicty 3804, a Khaliah Ali Collection dress. I hope to get started on it later today. With the holiday today, I must admit, I am lazing a bit. The laundry is in the machine, and I have been reading. I want to get to the Sunday papers and a few magazines I picked up - the new Threads and the new Sewing News. Wish me luck! Here is Angela in the scarf I made her for Christmas. It is in her favorite colors - lilacs, lavenders and other shades of the purple palette. Some Old Stuff - AND It is still Christmas here! Here are two images from an older project. It was for a friend's significant other, and they have been broken up for some time. BUT this is still an example of my crazy quilting. The small bag is in colors I would not use for myself. I am still distributing Christmas gifts!!!!!!!!! I have yet to get gifts to my good friend PEC - we've seen each other, but we just are not coordinated enough to remember the gifts!!!! This is a fleece scarf with a cotton applique on both ends of the scarf. I also bound the edges with one of the cottons. I made this for my co-hort at work. For some reason the photo Angela in it won't upload, so I will add another message with her photo. 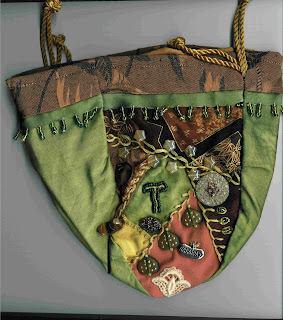 Christmas Present to Me - Wonderful Bag!!!!!!!!! I got a wonderful present for Christmas!!! 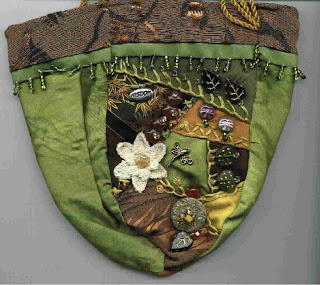 This is a photo of the wonderful African Plains bag my friend Paula from Devon, England made for me for Christmas. This is the front of the bag. This is the inside flap, after you open the purse. Behind it is a zipper compartment and it covers a pocket. And this is the front of the pocket the flap above covers! And this is the back of the purse. All the animals are appliqued onto the plain material. It is a wonderful bag. It was designed by a woman who lives in Brixham, Devon. Unfortunately, no sewing for me this weekend! Too busy playing Grandma. I have an addiction - fabric!!!!!!!!!!!!! I will post my new arrivals from the after Christmas clearance sales, in-store and on the web soon. Lets just say - the bargains were really good! And now - for me! First off, I want to show you my new sewing machine. I have a Viking 500 I've had for about 12 years. BUT I've been thinking about experiementing with embrodiery, so I purchased a Singer Quantum 250. It is both a regular sewing machine and an embrodiery machine. You can connect it to your computer and digitize your own graphics, etc. In the big Christmas sewing frenzy, I did not want to use the new machine in case I had problems, so gave the old Viking a real workout. But now I have the new one out and set up to sew as a regular machine. My plan is to sew as a regular machine for a while until I get used to it, then try the emboridery one long winter weekend! Here are the items on my "To Do" board. 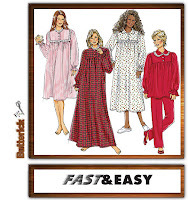 I want to make a couple of flannel nightgowns (given the cold weather in Ohio), so that is my first project - one from Butterick and one from McCalls. I think those are easy first "getting back to sewing" projects! I have had the Burda dress pattern for a while - not sure how long. I like the front detail, so I think that may be my first dress. There are a few more projects on the baord - an apron, shirts for my husband and a fleece vest for me, as well as a few dresses and tops/skirts. And then I want to try the two Hot Patterns pictured above - the Artful Dodger Dress and MEtropolitan Jacket. I have five yards of a nice aqua/turquoise/off white silk chiffon I will use for the dress. Not sure about what I will use for the jacket - I have some velvet but it is Christmas green, maybe some of the rayon I have in purple or hot pink. So stay tuned, I am going to start sewing to bead the band on these projects! My mum had her 80th birthday in September. As we were growing up, she frequently mentioned that she listened to Little Orphan Annie's adventures on the radio, etc. So as I was trying to think of something different for her birthday, I happened to run across this LOA doll on Ebay. Once I got it, I made several outfits for her. My husband said the clothes were too nice, "after all she is an orphan"! I had fun doing it. I got the suitcase item at JoAnnes on clearance - it was a bit beaten up, which was appropriate! I took these photos when I was home for Christmas. Above is her original red dress and white tights. Then the "party dress" I made for her. I used the 14 inch Betsy McCall pattern to make the jacket, top and pants. I used the Venus Dodget book to make the school dress and pinafore on the right. I could not find a real SANDY dog, so this little guy is standing in for Sandy. The white dress is a summer dress. The white baby doll pj's are from a Betsy McCall pattern. Little Orphan Annie's come to my house to stay. and brush the crumbs away. the fire and bake the bread to earn her board and keep. the goblins will get ya if ya don't watch out! and when they turned the covers down, he wasn't there at all! the goblins will get ya if ya don't watch out!! she mocked them and she shocked them and said, she didn't care. the goblins will get ya if ya don't watch out!!! Christmas Sewing Frenzy - Some of the Fruits!! I am still coming back to reality after a two week frenzy of sewing! I made SEVEN fleece blankets, four sets of kids hats, mittens and scarfs, nine purses, a man's robe, four pairs of flannel sleepers, a woman's hat, apron and two scarfs! Here are a few of the items. THE PURSE LINE UP! (Missing the others in previous posts.) Purse for one of my nieces. 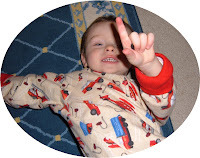 Z-Man indicates that he think's grandma's sewing is the best!